I don’t write much about UFOS. Frankly, flying saucers and litter green (or gray) men have no interest to me outside of old episodes of The X-Files. But something happened in Illinois in January 2000 that has never really been explained. A number of UFO sightings occurred in the southwestern part of the state – where I was living at the time – and got a lot of attention. And it wasn’t just in Illinois. The sightings gained national attention because there has likely been no other time that so many people witnessed something so unexplainable that it managed to perplex people all over America. The incident involved a number of reliable witnesses, which consisted mostly of police officers from a number of small towns in the area, and led many to believe that something very strange was going on in the skies over Illinois. Even more convincing than mere sightings, the officers maintained radio contact through most of the event, which carefully tracked the progress of a huge UFO that passed over the area. Adding to this, Scott Air Force base was only a mile or so out of the flight path of the anomalous craft and this helped to focus media attention on the event for weeks after it actually occurred. Something very strange visited southwestern Illinois on January 5, 2000 –--- but what it was remains a mystery to this day. The first person to notice anything strange during the early morning hours of that day was Melvern Noll, the owner of a miniature golf course in Highland. During the winter months, Noll worked as a truck driver, making deliveries at all hours of the day and night. He was just returning from a delivery at around 4:00 a.m. and before returning home, he decided to make quick stop at his miniature golf course, just to make sure everything was in order during the off-season. He parked his truck in the back of the building and as he climbed out, he looked up and noticed what he thought was a bright star in the northeastern sky. He didn’t give it much thought at the time and went into the building. After a few minutes inside, he left and locked the door behind him. As he walked back to the truck, he again noticed the bright light. This time, he stopped and looked at it more closely. It was then that he realized that the “star” was actually moving in his general direction. As he watched it, he began to realize that the light was a part of a much larger object. It looked like a giant rectangle in the sky that was roughly the size of a football field. It was very tall and had a set of “windows” that ran down the side. There were two floors with windows that emitted a very bright light, Noll saw, and as the object got closer, he also spotted a number of dim red lights on the bottom of it. The entire object was black or dark gray in color and he later described the thing as a “two story house” in the sky. Noll watched as it moved silently across the sky and as it passed to the southwest, he also spotted more windows across the back of the object. As the ship passed over him, Noll realized that it was moving much slower than a conventional aircraft and it certainly did not look like one. The entire sighting lasted almost five minutes. As the object vanished from sight, Noll promptly climbed into his truck and drove to the Highland police station. He was sure that no one would believe him but hoped that whoever was on duty might be open-minded enough to at least contact a neighboring town’s police department and see if the strange object in the sky could be verified. The dispatcher in Highland was skeptical of Noll’s account but because he did appear to be rational, agreed to put a call into the police in Lebanon and ask them to be on the lookout for anything unusual. Officer Ed Barton received the call in Lebanon at around 4:15 a.m. Not surprisingly, he was dubious of the report and first asked the dispatcher if he was joking. When he was assured that it was a serious call, he drove to the north end of town, past Horner Park, and onto Widicus Road. He saw absolutely nothing out of the ordinary but followed the road as it turned to the north and the east toward Illinois Route 4. A short distance along this road, Officer Barton looked up and saw two, large brilliant white lights in the sky. Curious, he now began to drive a little faster. When he arrived at Route 4, he turned south and headed back towards Lebanon, watching the lights from his driver’s side window as he sped along. At some point, he stated that the two lights seemed to merge into one and he turned on his overhead emergency lights, convinced now that the lights in the sky were part of a low-flying aircraft that was experiencing mechanical problems. The more that Barton drove, the more he started to notice details about what he was observing. He first noted that one of what he thought was a round light was actually somewhat long and cigar-shaped. He also saw that the object was not really moving but sitting stationary in the sky above the neighboring town of Summerfield. A few moments later, it began to move again, this time in his direction and Barton stopped his car. He turned off his lights and then turned off his car radio in order to hear the any sound the craft might be making. As far as he could tell, though, it was completely silent. As the dark shape got closer, he could make out more details. It appeared to be a massive, elongated, narrow triangle and at each corner, he could see a bright, white light. The lights never wavered in their intensity and appeared to be pointing straight down. They did not light up the ground, but they were, Barton noted, still very bright. Amidst them, he also saw a smaller red light that was flashing. The ship moved closer and the officer realized that all of the sky above him had now been blotted out by the shape. Even at this close distance, which he guessed at no more than 1,000 feet from the ground, the object made no noise. He continued to watch as it turned in a southwesterly direction, never banking like a normal aircraft would but rotating in the sky, always remaining completely level. Barton now scrambled for his radio and called in to describe what he was seeing. In between transmissions, he saw the aircraft start to pick up speed and travel away from him. As it did, he saw the back portion of it for the first time and would later describe it as rectangular and illuminated with white light. By the time he finished his last call, he told the dispatcher that he estimated the object was now above the town of Shiloh, about eight miles to the southwest. At this time, Officer David Martin of the Shiloh Police Department joined in on the sighting and radioed back that he could indeed see something in the sky. 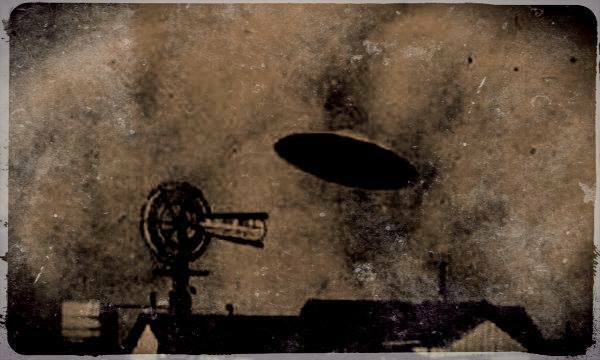 He had been driving along the southern end of town when he saw the mysterious object, which he saw moving to the west. Martin saw the three brilliant white lights, as well as the flashing red one, before he actually saw the dark mass of the ship’s body. He thought the object resembled a wide triangle or an arrowhead and as he chased after it, he stuck his head out the window to see if he could hear any sounds coming from it. Like the other witnesses, he heard absolutely no sound. Finally, the craft picked up speed and moved out of the area. By this time, the weird radio transmissions were attracting the attention of other officers on early morning duty in surrounding small towns. While a number of officers would eventually be involved in the sighting, one has to wonder how great the numbers may have been if the craft had appeared in the sky over a large Illinois city rather than a series of sleepy little towns with only a few policemen on duty. One officer who became curious about the affair was Craig Stevens, a cop in nearby Millstadt. After hearing the other calls, he drove to the east end of town in an attempt to see this thing in the sky. He drove around for a time, seeing nothing, and then ended up at Liederkranz Park on the north end of town. He was looking out the windshield of his squad car when he spotted a large, triangular shaped object in the sky. He described it as moving very slow and he said that it made no noise except for a "low decibel buzzing sound" that he could barely hear. As he watched, it moved to the north and he saw the white lights and the single red light on the bottom. Stevens called his dispatcher to report that he had seen the object and then grabbed his Polaroid camera and jumped out of the car. He aimed the camera at the object and took a photo. Unfortunately, the cold morning air and the dark of the early morning hours produced only a murky and barely discernible image. Dispatcher: Lebanon, this a call from Highland P.D. in reference to a truck driver who just stopped in. He said there was a flying object in the area of Lebanon. It was like a two-story house. It had white lights and red blinking lights, and it was last seen southwest over Lebanon. Could you check the area? Lebanon officer: Did they say the truck driver was DUI or anything? 10-4, I'm out. . . . Just a quick question. If I happened to find it, what am I supposed to do with it? If I see it, I'm not saying a word. . . .Also be advised the last thing that went over Lebanon -- this was approximately five minutes ago -- was a military cargo plane. It looked like a C-5.. . . Be advised there is a very bright white light east of town. It looks like it's just east of Summerfield, and it keeps changing colors. I'll go over there and see if it looks like an aircraft. It doesn't look like an aircraft, though. . . . It's not the moon, and it's not a star. If you would, will you contact Scott Air Force Base and see if they have anything flying in this area please? Whether it's a plane or not, it's heading westbound now. It should be really close to Scott now. . . . As a matter of fact, if the Shiloh officer looks up, they can probably see it by now. Shiloh officer: I see something, but I don't know what the heck it is. . . . It's probably heading to Lambert (St. Louis Airport). Millstadt officer: I've got that object in sight also. Dispatcher: . . . Does it look like a -- What does it look like to you? Millstadt officer: Really. Millstadt officer: Does Dupo have a Polaroid? Dupo officer: 6004, this is 3923 on County (radio channel) 2. Millstadt officer: 6004, go ahead. Millstadt officer: Is it very large? Dupo officer: It's hard to tell. It's pretty far off in the distance. Dupo officer: This thing appears . . . it's probably 20 or 30,000. It's about where planes usually are. It's not low at all. For more about UFO sightings and other general weirdness in Illinois, see Troy’s book WEIRD ILLINOIS! The Dupo officer mentioned in the transmission reports was the last police official to report seeing the object that morning. After hearing Officer Steven’s radio traffic, he decided to have a look for himself as to whether or not a huge craft was passing over the area. About five minutes after Stevens’ sighting, the Dupo officer also saw the array of lights over his town. However, he stated that the lights were at a fairly high altitude and were heading to the north and northeast. In fact, they were now so high that he likely would not have noticed them if not for the radio calls that he had been listening to. He watched it through binoculars but because of the distance, he really couldn’t make out anything other than the red and white lights. He could see nothing of its shape or size. After that, the object disappeared from the sky but landed firmly into the mysterious history of Illinois. What was this bizarre ship? Was it really a UFO that would have passed over Illinois without incident if not for the watchful eyes of a miniature golf course owner and a few small town police officers? If it was, one has to wonder how it could have passed within one mile of Scott Air Force Base without causing some grave concerns on the part of the military. They would later state that they knew nothing of the large ship, leading many to believe that perhaps their denials only hid the fact that this was some sort of test plane and not a mysterious vessel at all. But those who might suggest that the craft came from Scott Air base can forget about that. My brother was in the Air Force for many years and spent a few of them stationed at Scott. He told me flat out that not only are there no test planes kept at Scott but there would be no place to land anything like what was described that would be away from the public eye. UFO? Secret test plane? Or something else altogether? No one knows but one thing is certain, those officers certainly saw something in the Illinois sky that night. For now though, what it may have been remains unexplained.